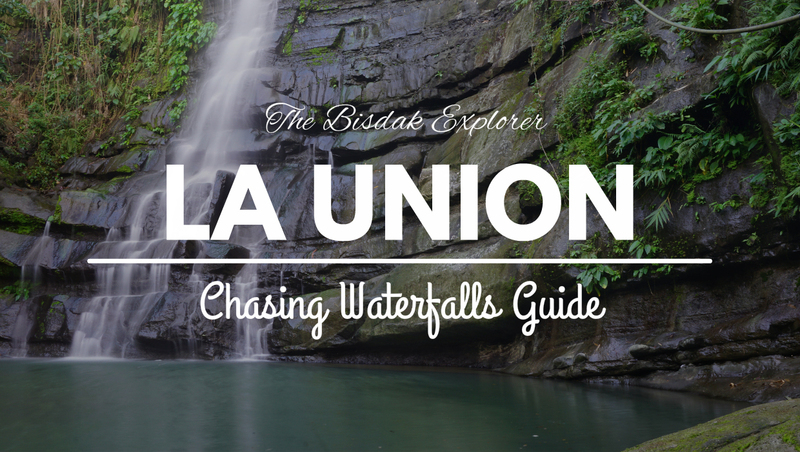 La Union is the last place I would thought to be a good place for some waterfall chasing adventure but boy! was I wrong. A few weeks ago a friend brought to my attention of what looks like a breathtaking waterfall in La Union featured in the movie Flotsam with the ever seductive temptress in local scene Solenn Heussaff. That moment builds my curiosity of La Union and as I go along with my research I've found 11 waterfalls and counting. Waterfall ranging from stunning to an okay with a difficulty that would make me question my safety chasing that waterfall to a walk in the park scenario. 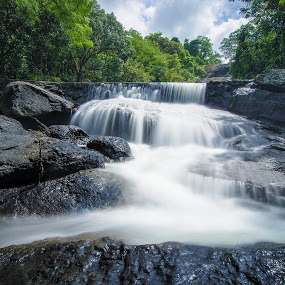 As I was getting excited for my trip in that province next weekend I've collated all the waterfalls in this post and credited the photos & blogs that would make anyone want to go there. Without further ado, here are the waterfalls in La Union I could find, their locations and how to get there. UPDATE: The master waterfall chaser himself Angel Lakwatsero shared his researched lists of waterfalls in La Union to me. I highlighted those I featured in the post below. From Manila take any bus going to any of these north-western Luzon places namely: Laoag City, Vigan City, Candon City, Abra and La Union. Inform the driver/conductor that you be dropped at the Bauang town plaza. Then, ride a jeepney or mini-bus at the waiting shed some few meters away eastwards near the public Library. At Naguilian Town proper, take a tricycle or jeepney bound for the town of Bagulin, which is about 6 Kilometers away from the town proper of Naguilian. 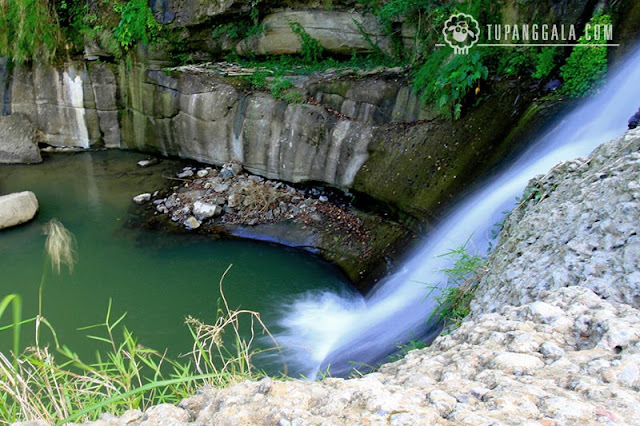 The jump-off point is at Barangay Tuddingan (just after a bridge) and from there, walk your way to the falls. 1. From surfing areas in San Juan take a jeep going North to San Gabriel (has a sign in front says going to San Gabriel). For around 20 minutes. 2. Hire a motorcycle taxi to take you to the falls area. Usually there are drivers waiting in San Gabriel town. The roads are steep so tricycles usually can't take you further up. Arrange time when they would pick you up. Price range from 200php up per head for this 30 minute ride. 3. They will drop you off at a waiting shed and from there you start walking downhill, follow the road until it turns into a muddy track, then smaller track going to the rice fields. 4. Follow the tracks to the pilapil (middle of rice fields), then once you see the irrigation water follow it further until you get to a dam, then from the dam, you cross the river then just follow the stream of river to get to the falls. From San Fernando City, La Union, take a jeepney bound to Luna, La Union. Fare is Php 50 and travel time is around 45 minutes. From San Juan, wait for ordinary/air-conditioned buses bound for Vigan, Candon or Laoag. Tell the bus attendant that you will be going to Luna and will drop at Balaoan (fare is Php 30). Tricycles going to Luna are available near 7Eleven, fare is Php 10. Occalong Falls located in the lush nature of Barangay Cabalitocan. From the plaza, I chartered a tricycle going to the falls at Php 200 for the roundtrip fare and waiting time. The falls is 20 minutes away from the town proper. Locals also flock the falls to cool down the summer heat. An entrance fee of Php 10 is being collected. From Balaoan Town Proper, ride a jeep bound to Santol. Then from its town proper, hire a tricycle going to the entrance of Balay-Anito. Get ready to hike from the entrance down to the falls. Just follow the downstream and you won’t get lost. Good thing, there’s no entrance fee, but make sure to spend some for food and drinks to town before you go to the falls. Arosip Ecotrail : 45-minute descending trek where three waterfalls await. From Manila take a bus bound for any of these Nortwest Luzon places : Laoag City (Ilocos Norte), Bangued (Abra), Vigan City (Ilocos Sur) and Candon City (Ilocos Sur). You have to get down at the Bus stop near the Public Supermarket of Bacnotan, La Union. 1- wait for the jeeps bound for Barangay Sapilang and get down at the road going to barangay Arosip in Barangay Casiaman. 2- ride a passenger tricycle going to Barangay Casiaman and get down at the road going to Barangay Arosip. After going through either one of the steps 1 and 2 , hike your way up on the road going to Barangay Arosip Proper (where the Barangay Auditorium is located). At the Barangay Arosip Proper, visit their Barangay Hall or ask for the house of the Barangay Captain where you may request for a "guide". With the "guide" you may now hike your way to the falls. If you are coming from Manila, you can take a bus going to any of these Northwestern Luzon places: Laoag City, Vigan City, Candon City and Abra. You have to get down at Bacnotan, La Union. At Bacnotan look for the jeep bound for SAPILANG (they usually stop at the bus stop some few meters away after the Cemetery to get passengers) with about 10 pesos or 12 pesos fare. Just tell the driver that you are going to Sapilang waterfalls. At Don Mariano Marcos Memorial State University – North La Union Campus (DMMMSU NLUC) ask permission and walk your way to the waterfalls. Visiting the Guinabang Falls found located at Barangay Guinabang is worthwhile for a weekend escapade. Tourists will find adventure by walking along rice fields for about 30 minutes from the barangay hall, crossing at a hanging bridge and passing through a small river before they reach Guinabang Falls. Carbonnel, however, cautioned visitors to be careful as they approach the falls. “They must be careful walking along the stream because stones and riverbed were slippery,” he said. 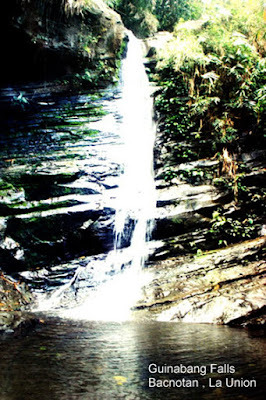 At the falls, one can swim into the waters and could catch some small shrimps and cray fish. 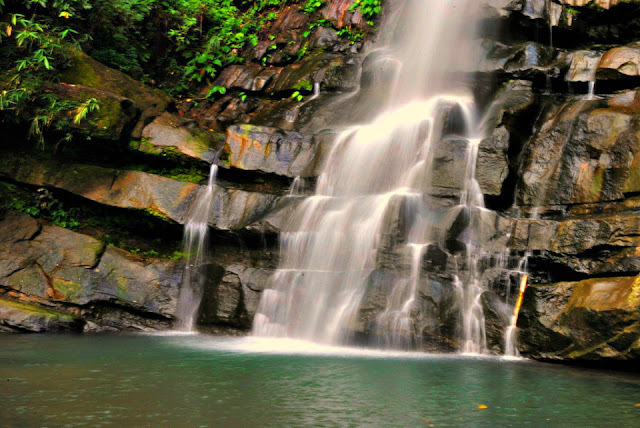 Meanwhile, Carbonnel said that their locality is pleased that both domestic and foreign tourists have started to discover the falls and recognize their beauty. Driving up north from the town proper as the point of origin via public utility vehicles such as tricycles, jeepneys and private cars, we reached Gusing Sur after passing through Barangay Ortiz, Lioac Sur and Lioac Norte respectively in a thirty-minute ride. In Barangay Gusing Sur we drove right of the Aspiras waiting shed to Sitio Tawi-tawi for about five to seven minutes in an asphalted and cemented road. At the end of the cemented road is a trail that leads to the base of the mountains of Gusing Sur. The sweet and warm smiles of the local residents are heart warming, so we waved and smiled back. 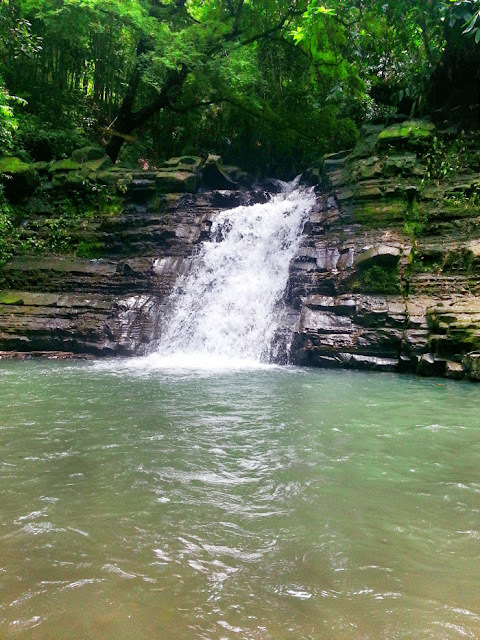 After a five minutes walk, we arrived at the base of the mountain where we found a swimming lagoon called Pit-il the water of which comes from the top of the mountain where we latter saw another magnificent wonder, the Sangbay Falls.